The warm weather this week inspired me to make recipes that didn't require a hot stove. BBQ chicken sandwiches, a no-bake chocolate eclair bar dessert, and a glorious pasta salad were some of the dishes I whipped up this week. Do you have a favorite warm weather recipe? I'm always looking for ideas. It took me over 2 weeks to read The Oregon Trail. It had nothing to do with the book and everything to do with me. It was a wonderful and information packed read. It will come as no surprise that I'm reading Go Set a Watchman right now. Along with (almost) everyone else in the world. I haven't read any think pieces about it and I've also stayed away from all the reviews. I wanted to go in as blind as possible and to make up my own mind. The nonstop binge-watch of Scandal came to an end. Thankfully. I loved every second of it but I didn't read for days and days. I'm trying to stay away from the allure of Netflix, for a little while at least. It's much too easy for me to find myself mindlessly staring at a screen. STAY STRONG, JENNIFER! Tif Talks Books shares her most popular image from Instagram every month. I thought that was a genius idea that was well worth stealing. (Thanks, Tif!) I'll share my most popular image of the week here, or maybe in its own post? We'll see what happens. 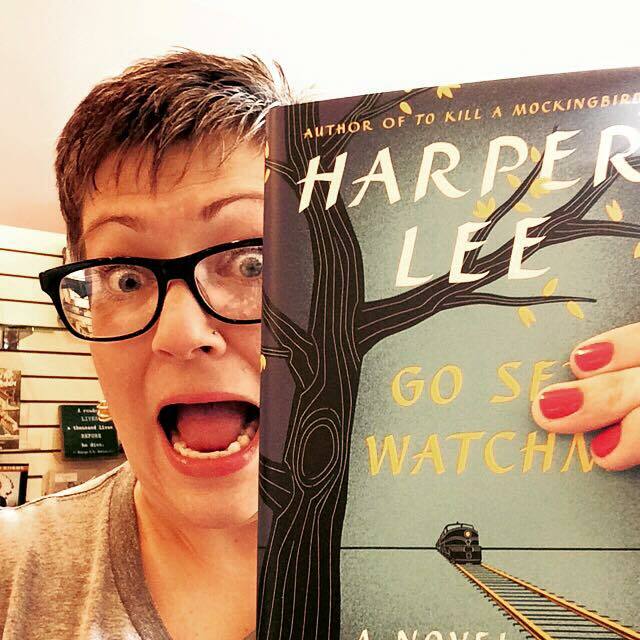 My Watchman selfie was the most liked image I shared this week. I must thank Shannon for making my Weekly Wrap-Up graphic. I'm all thumbs when it comes to anything having to do with design and/or creating images. She, on the other hand, is a phenom. I hope you've all had a great week. I hope you've been eating amazing food and reading amazing books. Tell me all about it below! Lol, yep! I'm closing in on the end. It's made me more emotional than I thought it would! How were those BBQ chicken sandwiches?! They look super yum. I'm job searching right now, so trying to stock up on great crock pot recipes that will make cooking easier once I go back to work. I am going to add The Oregon Trail to my audible wishlist - it sounds great! They were really good. I think they could have used a little more oomph so I'll up the spice quotient the next time around. They were easy as 1-2-3 to make. Gotta love that! I hope you do get to The Oregon Trail. I learned so much. Amazing food? Sure...wings are amazing as always. :) Amazing books? Reading the Easy Rawlins mysteries by Walter Mosley right now and they're pretty good. 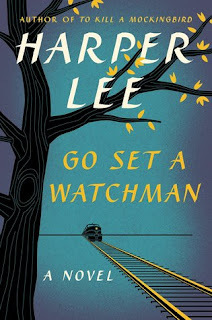 I'm not reading Go Set A Watchman, but I'm looking forward to hear what others thought of it when they're done. I'll have to check out your thoughts later. I'm nearing the end of Watchman. It's both better and different than what I expected. Of course everyone is reading Go Set a Watchman ... but me hahahha :) I just had breakfast but now the photos are making me hungry. Maybe I'll look up the no-bake chocolate eclair bar dessert! After reading some of the early headlines about Watchman I almost wanted to skip it. I'm glad that I didn't actually READ any of the articles and I'm glad that I decided to go ahead and buy the book. That dessert is delicious and easy! If you were able to go into Go Set a Watchman without any spoilers, I'm impressed. I tried to stay away from them but the stupid internet (namely Facebook) foiled me! Well, I did see the NYT headline, along with the rest of the world. :/ I wasn't happy about it, believe you me! I've had family down the last couple of weeks and been wining and dining all kinds of cousine. I like just about any kind of food. LOL Been binging on Netflix and watching some of Stephen King's older horror movies. Plus reading every thing I can manage! Netflix is dangerous, isn't it?! Although I can only watch an hour or two of TV before I'm ready to go read (or, more often, feel the pressure of all the unfinished tasks on my to-do list.) Have a great week! I'm exactly like you: I want to go into the reading of Watchman cold. Let's see what we think! Those BBQ sandwiches sound amazing! I have a few summer salad recipes that I'm in love with: strawberry quinoa salad, roasted sweet potato and wild rice salad, and gnocchi caprese salad. Oh my gosh, thank you so much for the recipes :D I'm going to go check them all out! You should definitely try the BBQ chicken, it's so easy and tasty. Argh gotta get back to reading Watchman. I've got such mixed feelings about it, it's made it hard to settle down to reading it! It was hard to not let my mind spin as I was reading it. I stayed away from articles/opinions/etc. but my own expectations were swirling in my head. I'm glad I read it but it wasn't easy. I've heard good and bad things about GSAW, but it's all making me think maybe I'll pick it up soon. And before I re-read TKAM. Might be best to save that for after, for comfort if I need it.